A collection of shopping cards clustered in a corner at the back of a Stop & Shop. There is a back path behind my local Stop & Shop that I don't often take when walking in this direction, but I did this morning and found this sight. 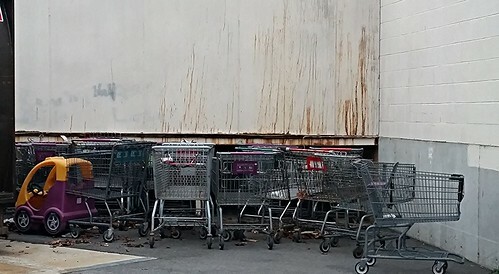 It's unclear why they are gathered here, but I can imagine this is where misfit shopping carriages go when they no longer work properly or maybe this is where they store extras. Regardless, it seemed like a mortuary for shopping carts--waiting to be sent off for their final departure. I think the streaks along the wall also add to this sad scene as does the child-cart. All of it speaks to the demise of these carts.